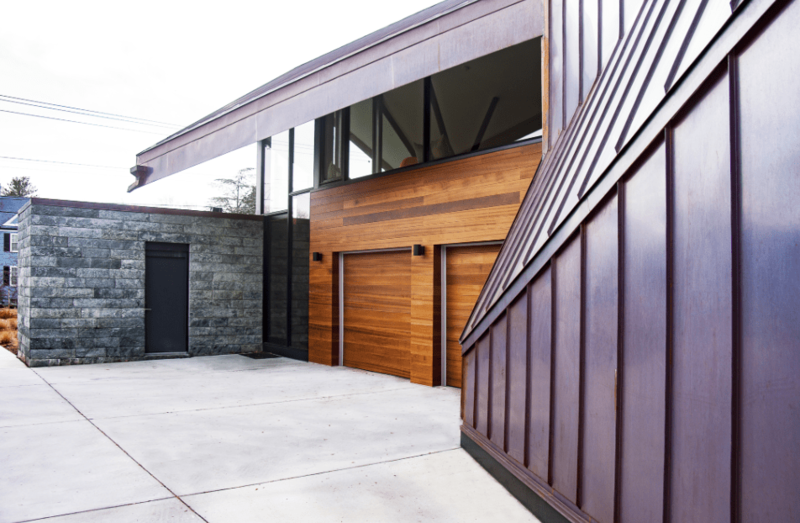 A recent residential restoration project in Alexandria, Va., certainly qualifies as “trophy stuff,” taking home a North American Copper in Architecture Award from the Copper Development Association (CDA) in the “Restoration: Roof and Wall” category. It’s easy to see why. The origami-inspired design features multiple roof angles, but the daring design was problematic. Even though the home was relatively new, the owners were plagued by leaks. Along with Restoration Engineering Inc. of Fairfax, Va., Wagner Roofing was called in to consult on the project, determine the source of the leaks, and come up with a solution. The original galvalume standing seam roof channeled the water into a large, stainless steel internal gutter with roof drains. Jagusch found that the leaks were occurring at two types of critical points. First, there were leaks where the internal roof drains met the central gutter. The other problem spots were along the pitch transitions. Jagusch felt that installing a conventional-style painted galvalume roofing system in those spots was almost impossible. “We felt that was since it was an area that was failing, we wanted a metal we could work with when we met a transition and turn the panels vertical where we needed to without having to break them and rely on rivets and caulk,” he says. Copper was the answer. 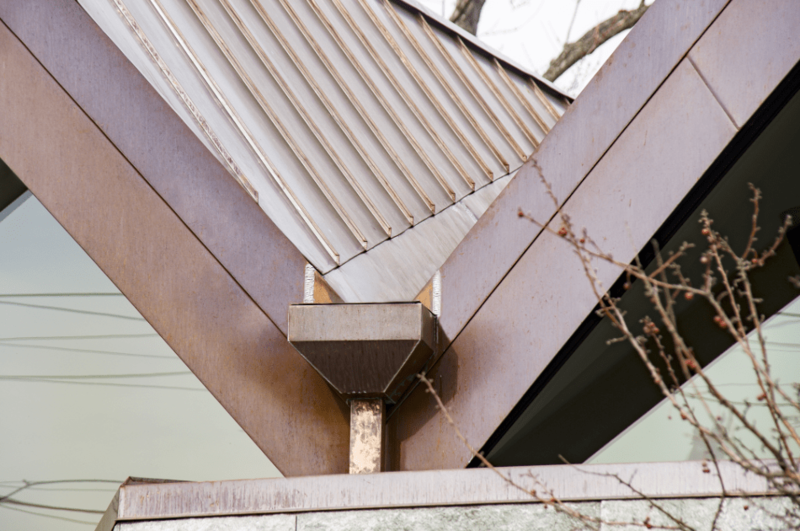 “The detailing was pretty tough to do, so we recommended changing it to copper so we could work with it, be able to solder and have a more seamless roofing assembly,” Jagusch recalls. The team decided that installing a copper roof system with a new drainage plan would be the best way to eliminate the leaks and keep the inspiring look the homeowners desired. Panels were roll formed at the Wagner metal shop out of 20-inch-wide coils using an ESE roll former and trailered to the jobsite. Approximately 5,400 square feet of copper panels were installed on the project. The double-lock seams were mechanically seamed. Twenty-ounce copper flat-seamed panels were used in the large valleys. In addition to the roof, all of the metal cladding was replaced on the southeast feature wall. The top of the wall was reconfigured to accommodate the new sloped valley. Where the wall met the roof, a band was fabricated to match the top part of the fascia. Other details included copper cladding for the chimney. Drainage was redirected to the perimeter, where custom-fabricated gutters were installed. 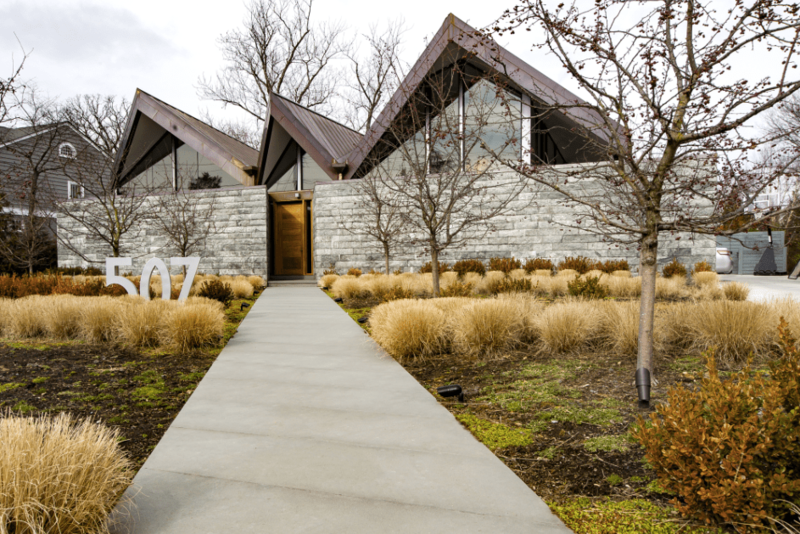 “On the west side, the roof was originally designed to dump off straight onto a rock feature on the ground, but we fashioned a custom copper box gutter about 35 or 40 feet long,” Jagusch states. At the either end of the large internal gutter and at the end of a large valley, shop-fabricated copper conductor heads were installed. Custom five-sided downspouts were fabricated, but installing them posed another challenge, as large window areas offered few options for support. The downspouts had to be snugged up under the framing system.